How to plant onions depends on the type of onions you're planting and the stage of growth of the transplant. Onions may be started as seeds, seedlings or in sets, each reflecting a level of maturity, with seeds taking the longest to grow and sets, the shortest amount of time. Onions may be started from seeds, seedlings, or sets. Seeds are self explanatory; they're the seeds taken from mature onion flowers that when planted in the ground, eventually grow to form plants. Onion seedlings are small plants you can purchase at the garden center in the early spring. They're sold similarly to tomato plants and other vegetable plants. Sets are unique to onions and other vegetables in the allium family, such as garlic. Sets consist of the green, leafy stems of the plant and a bit of the root. Sets grow best when the root portion has a small onion bulb on it. Look for sets with bulbs the size of peas or marbles for best results. Onions are most often referred to by color, such as white, red or purple, and by "day," as in long day or short day. Long and short day onions refers to the length of daylight needed by the plant to grow the bulb portion, the part you eat. Long-day onions need a long length of day, such as 14 to 16 hours of sunlight, to create the bulb; short day onions need less daylight. Long day onions are typically grown in more northern regions while short day are grown closet to the equator. For the best onion varieties that will grow in your specific gardening zones, as well as information on how to plant onions, call or visit your local County Cooperative Extension's website. It's best to start your onion seeds indoors. Use a commercial seed starting mixture and a clean seed starting tray or cell packs. 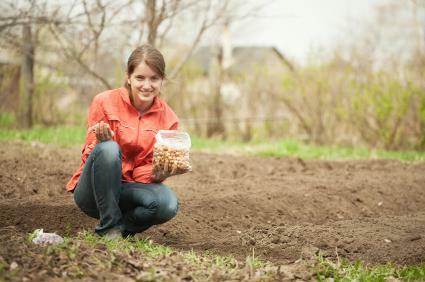 Place one seed in each compartment, burying it ¼ to ½ inch deep in the soil mixture. Keep the soil evenly moist until the seedlings emerge, then water as necessary. Trim the tops to keep the leaves about four inches tall. Harden the seedlings off or gradually acclimate them to outdoor temperatures for about two weeks before transplanting them into the garden beds outside. They will need bright, full sunlight for six or more hours a day and loamy soil. When you start onion seeds indoors depends on the variety and type of the onion as well as your gardening zone. Look on the back of the seed package for the dates to start and grow seedlings indoors, and follow directions based on which part of the country you live in. Onion seedlings are planted very much like any other kind of vegetable seedling. After all danger of frost is past, plant seedlings outside with soil just up to the top of the little onion bulb on the root system. Leave at least four inches of space between seedlings to allow room for growth. Sets are planted similarly to seedlings. Plant sets about one inch seed, and about two to three inches apart. Leave about a foot of space between the onion rows. Water well until the sets become established in the garden bed. You can estimate how big the onion bulb under the soil is by looking at the green, leafy parts above soil. The slender green stalks above the soil are the onion's leaves. Each leaf represents approximately one layer inside the onion bulb itself. The more green leaves you have, the larger the onion. You can dig gently around the root area to estimate bulb size. Some onions grow larger than others, so be sure to know the estimated number of days to harvest based on the variety of onion you've planted. When you're ready to harvest your onions, dig up or pull the onions out of the garden in the morning. You can lay them on top of the garden bed to let them dry during the day. Brush off the excess dirt. You'll need to dry them for two to three weeks before storing them. You can lay them on old window screens in a covered place or in boxes in a covered place. Keep them dry, allowing good air circulation among the bulbs. Some people like to braid the green tops together and hang the onion bunches in the garage, shed or attic to let them dry. After the onions are completely dry, they can be stored in a root cellar or cool, dry place until used. Do not peel off any of the dry, papery skin on the bulb; it protects the bulb and keeps it fresh during storage.